Thanks for making Line Break #12 such a great time! 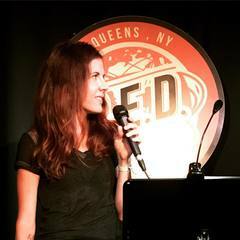 A gigantic thanks to everyone who turned out for our twelfth regular episode of Line Break this past Saturday, at beautiful Q.E.D. in Astoria, Queens. Just by showing up and giving us the gift of your attention, you helped make the afternoon bigger and better than it would have been without you. Thanks as always to Q.E.D. for giving us the space and an opportunity to use it. And thanks especially to our amazing readers, who made it the incredible show it turned out to be. Dennis Pahl brought us absurd, surreal stories and film. 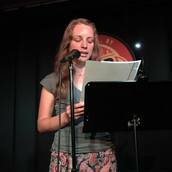 Susana H. Case read poems of youthful adventures in a younger New York City. Ilana C. Myer evoked a world where poets wield ultimate power. Norman Stock's dry poetry skewered and illuminated everything from hunting to religion to priapic teens to writing workshops. And Julia Wertz treated us to a dazzling series of images from her new book, Tenements, Towers & Trash: An Unconventional Illustrated History of New York City. If you couldn't make it out on Saturday, please mark your calendar for Saturday, November 4th, when we'll we back with our thirteenth issue, featuring Austin Grossman (Crooked, You, Soon I Will Be Invincible), Sam J. Miller (The Art of Starving, Blackfish City), Kem Joy Ukwu (Locked Gray/Linked Blue), Matthew Kressel (King of Shards), and legendary poet David Mills (The Dream Detective, The Sudden Country). We look forward to seeing you again in November! Until then please check out all the terrific shows and events at Q.E.D. There is something amazing happening there literally every day. Reminder: Line Break #12 is this afternoon! Hey, kids! Q.E.D. will have copies of cartoonist Julia Wertz's brand-new book, Tenements, Towers & Trash: An Unconventional Illustrated History of New York City on hand this afternoon for purchase. Whatever you do, don't miss today's show! Saturday, October 7, 2017, 3:00-4:30 p.m.
Dennis Pahl is Professor of English at LIU Post, where he teaches nineteenth century American literature. 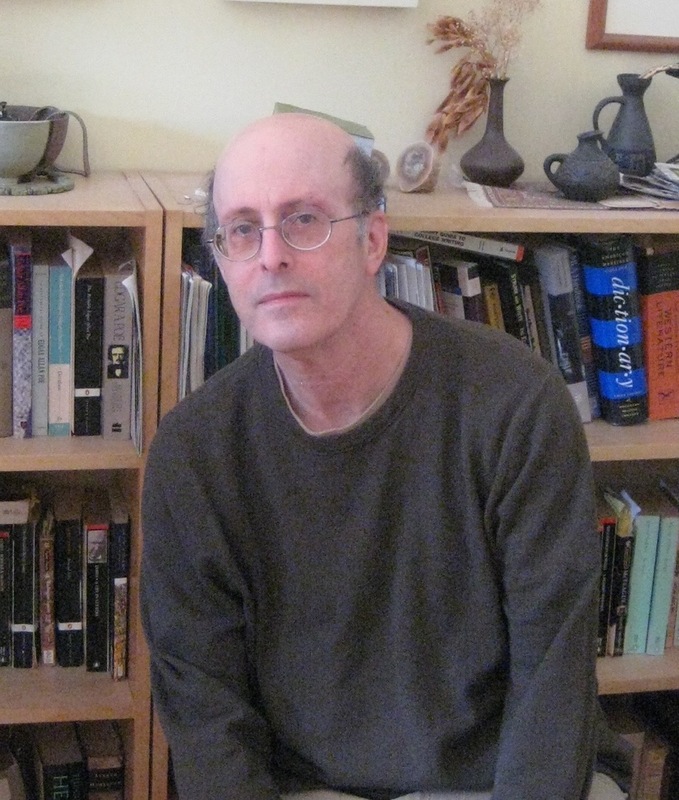 He is the author of the book Architects of the Abyss: The Indeterminate Fictions of Poe, Hawthorne, and Melville (U. of Missouri Press, 1989) and has published numerous scholarly articles on American literature in academic journals. His scholarship also has appeared in books of critical essays on Henry James and Edgar Allan Poe. He has received a grant from the National Endowment of the Humanities and was awarded a Fulbright Fellowship to teach American literature at Haifa University, Israel. Aside from his academic scholarship, Mr. Pahl writes fiction, with an eye toward discovering the strange and absurd inside of the ordinary. Most recently his story "Touring" was published in the journal Confrontation. He is also the author of several chapbooks for Feral Press, including the collections Orlov & Friends, Tales of Hope and Melancholy, and the upcoming Falling Man and Other Stories. His story "Evening Class" was adapted to the screen and shown in three international film festivals, including the Big Apple Film Festival; and his story "Foot in the Door" was made into a short movie directed by Gregory Cioffi, who also directed the upcoming film "The Museum of Lost Things," based on Mr. Pahl's story of that name. Working with his wife, the artist Luda Pahl, who has illustrated the stories published by Feral Press, Mr. Pahl has also published a collection of absurdist cartoons called Shall We Go and Ruin It? 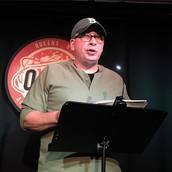 Please join Dennis and all our amazing readers for Line Break #12, Saturday, October 7, 3:00 p.m. at Q.E.D. in Astoria. Tickets are only 7 bucks! Julia Wertz is a professional cartoonist and amateur historian. She has published five graphic novels and does monthly history comics for The New Yorker and Harper's Magazine. Through "then and now" drawings and tales of New Yorkers past, her latest book, Tenements, Towers & Trash: An Unconventional Illustrated History of New York City, paints a raw, unconventional, and often hilarious portrait of New York in all its neurotic glory. From an extensive underground pneumatic tube system build by the New York Postal System in the late 1800's to the pizzeria that fronted for mafia activity; from beloved bookstores to outlaw abolitionists to a bottle-filled beach where horse carcasses were once sent to rot, Wertz illuminates the stories behind some of the city's most famous and infamous mainstays and provides little-known backstories to its not-so-secret gems. It's a New York you won't find in any guidebook, one where the bustling bodegas, crumbling corners, and hideaway hotspots are not just part of its charm but integral to its character. In Tenements, Towers & Trash we come to see how the city's dirtiest, ugliest, most eccentric areas are ultimately what make it so beautiful and extraordinary. 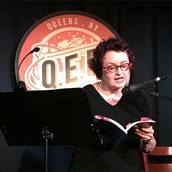 Please join Julia and all our tremendous readers for Line Break #12, Saturday, October 7, 3:00 p.m. at Q.E.D. in Astoria. Tickets are only 7 bucks! Ilana C. Myer has written about books for the Globe and Mail, Huffington Post, Los Angeles Review of Books, and Salon. Previously she was a journalist in Jerusalem. Her debut epic fantasy, Last Song Before Night, was released by Tor in October 2015. The sequel, Fire Dance, will appear in April 2018. 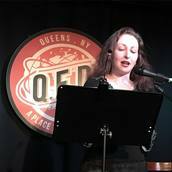 Please join Ilana and all our tremendous readers for Line Break #12, Saturday, October 7, 3:00 p.m. at Q.E.D. in Astoria. Tickets are only 7 bucks! 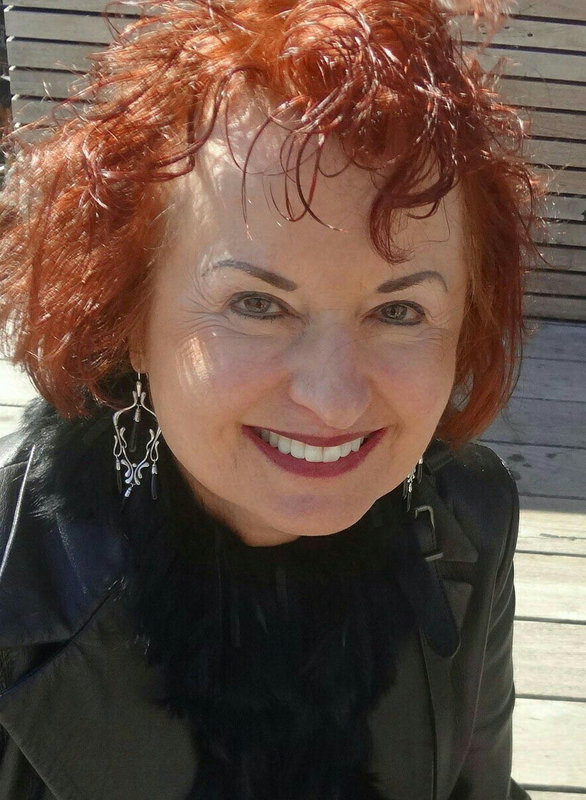 Susana H. Case is the author of five books of poetry, most recently, Drugstore Blue, from Five Oaks Press in 2017, and 4 Rms w Vu from Mayapple Press, as well as four chapbooks. One of her collections, The Scottish Caf�, from Slapering Hol Press, was re-released in a dual-language English-Polish version, Kawiarnia Szkocka, by Opole University Press in Poland. Her poems appear widely in magazines and anthologies. 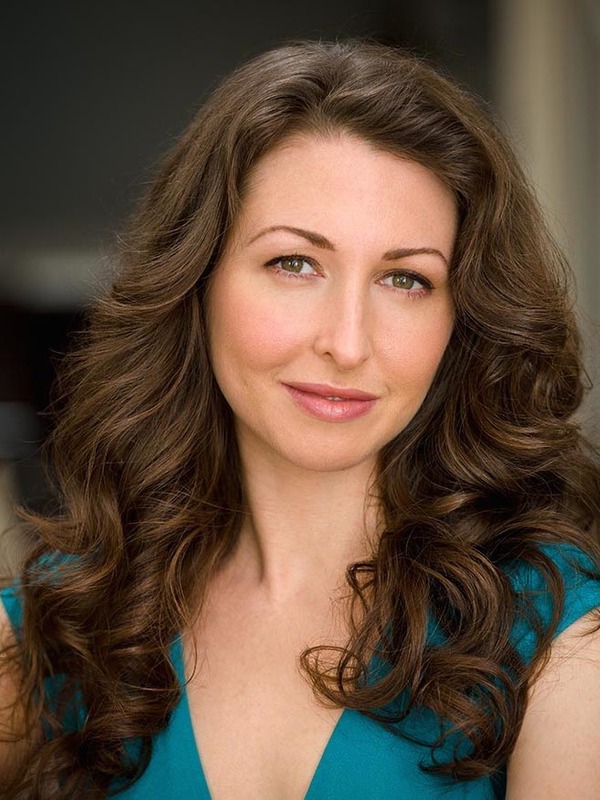 Case is a Professor and Program Coordinator at the New York Institute of Technology in New York City. Please visit her at susanahcase.com and facebook.com/susana.case. 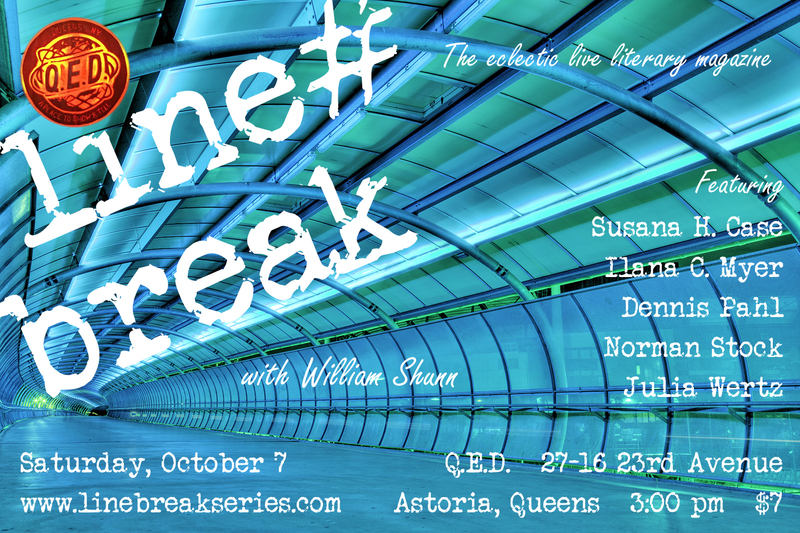 Please join Susana and all our accomplished readers for Line Break #12, Saturday, October 7, 3:00 p.m. at Q.E.D. in Astoria. Tickets are only 7 bucks! 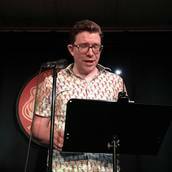 Norman Stock is the author of two books of poetry: Buying Breakfast for My Kamikaze Pilot (Gibbs Smith, 1994), winner of the Peregrine Smith Poetry Contest, and Pickled Dreams Naked (NYQ Books, 2010). 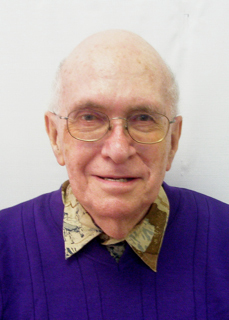 His poems have appeared in The New Republic, College English, New York Quarterly, New England Review, The New York Times, Newtown Literary, Verse, and many other magazines, as well as in anthologies and textbooks. 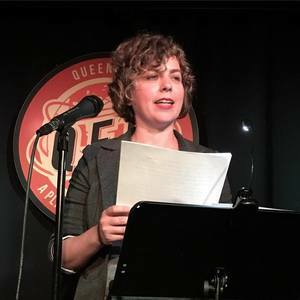 The recipient of awards from the Writer's Voice, Poets & Writers' Maureen Egen Writers Exchange, the Bennington Writing Workshops, and the Tanne Foundation, Norman has also been a Bread Loaf fellow, a Sewanee scholar, and a finalist for Poet Laureate of Queens. Formerly the Acquisitions Librarian at Montclair State University, from which he retired in 2005, he lives with his wife, Lydia Chang, a clinical psychotherapist, in Jackson Heights, Queens. 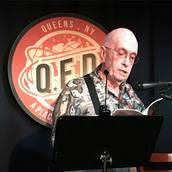 Please join Norman and all our world-class readers for Line Break #12, Saturday, October 7, 3:00 p.m. at Q.E.D. in Astoria. Tickets are only 7 bucks! Thanks for making Line Break #11 so amazing! 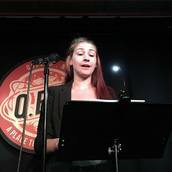 A huge huzzah to everyone who turned out for our eleventh regular episode of Line Break this past Saturday, at beautiful Q.E.D. in Astoria, Queens. Just by showing up and giving us the gift of your attention, you helped make the afternoon bigger and better than it would have been without you. And you did it despite the damn shuttle buses that were trying to scare you away! Thanks as always to Q.E.D. for giving us the space and an opportunity to use it. And thanks especially to our amazing readers, who made it the incredible show it turned out to be. 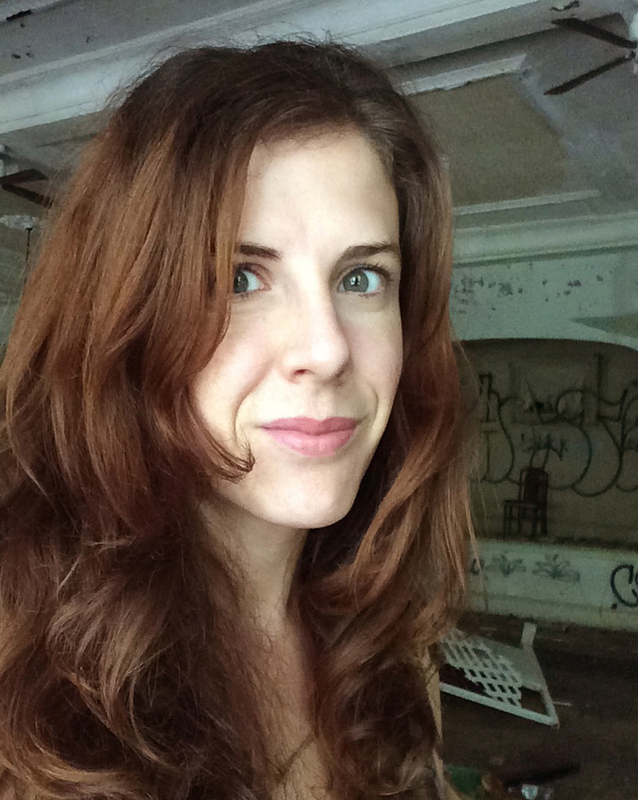 Amanda Claire Buckley brought us harrowing fiction of food and obsession. Kyle Thiessen took us on a hilarious journey into a zombie apocalypse with ghosts. Monica Wendel showed us the world through a grade-school detective's eyes. 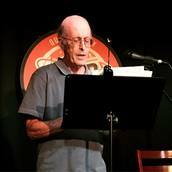 Robert J. Howe read us incredible poetry. And Eden Robins showed us a very peculiar automat in a very peculiar afterlife. If you couldn't make it out on Saturday, please mark your calendar for Saturday, October 7th, when we'll we back with our twelfth issue, featuring Susana H. Case, Ilana C. Myer, Dennis Pahl, Norman Stock and Julia Wertz. We look forward to seeing you again in October! Until then please check out all the terrific shows and events at Q.E.D. There is something amazing happening there literally every day.